That was a tough win, but the Army Team had a great night, beating Navy with some authority. They weren’t perfect by any means, but a win is a win, and any time you can beat Navy, it’s a Hell of an accomplishment. It is not easy to win in college football, and it’s especially tough to win three in a row in the greatest rivalry in sports. I’m fired up! Along with the Army Team, I feel like we had a pretty good night here at As For Football as well. If you read the Preview and/or listening to the podcast, you heard us say some stuff, and most of that proved right on the money. Do us a favor and shout us out to your friends, yeah? 1. We said not to take Army (-7). We told you to wait until the line fell to Army (-6.5). That happened sometime late Friday morning, and if you took it, it paid. I don’t know how many folks read the @asforfootball #ArmyNavy Preview. But at least *some* of you ought to remember that I said to wait until the line fell to Army (-6.5) & the bet the BKs to cover. 2. We said that both teams were about even running the football, but that Army had an advantage passing. We even said that Army needed to throw the ball about ten times. In the event, QB Kelvin Hopkins finished 4/9 for 61 yards with 2 drops (one each by SBs Kell Walker and Jordan Asberry). 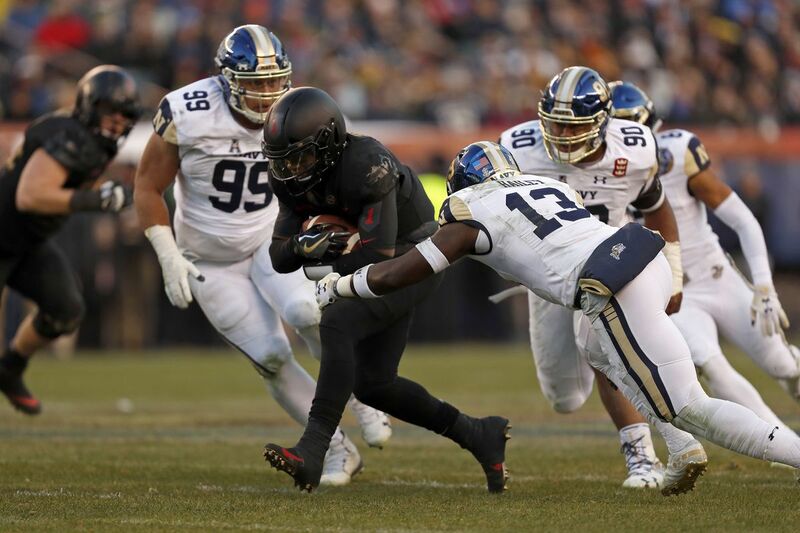 Really, Hopkins didn’t look great throwing the ball–he was a little late on a few throws, and he threw one that should have been picked down by the goal line–but with Navy’s defense playing so close to the line-of-scrimmage, Army really had to pass to have a chance to be successful. 3. 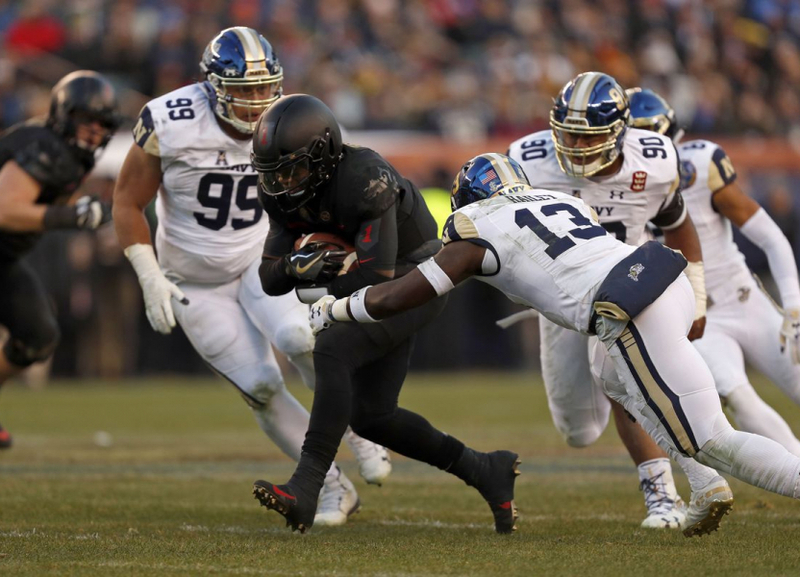 We said that Army’s defense would be the deciding factor in the game, and that Army’s rushing defense would force Navy to throw to stay in the game. That absolutely happened. 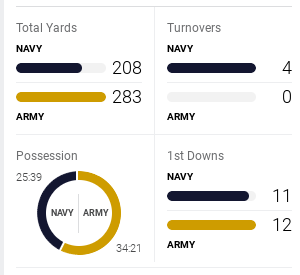 On the day, Navy had 37 carries for just 127 yards, 1 touchdown, and 2 fumbles lost. They were constantly behind the chains, finishing just 3/13 on 3rd downs and 2/3 on 4th downs. With that, the Mids were indeed forced to throw, going 5/17 passing for 81 yards, 2 interceptions, and a sack-fumble. 4. We said that QB Garrett Lewis was Navy’s most dangerous quarterback because he had the best passing ability. Lewis went 5/11, throwing all of Navy’s completions and neither of their picks. By comparison, Zach Abey went 0/5 with 2 picks and the sack-fumble. At this point, I think it’s fair for Navy fans to wonder What Might Have Been had Lewis been their starter all season. He’s not nearly as fast as SB Malcolm Perry nor as tough between the tackles as Abey, but he manages the triple-option better than either of the other guys, and he takes care of the football. Navy had four turnovers last night; that’s how you lose in this rivalry. For what it’s worth, the Malcolm Perry Show really screwed up Navy’s season. I’m so, so glad that Coach Jeff Monken didn’t insist on forcing Kell Walker into a similar situation after the initial experiment at Duke failed to produce. 5. We said that Navy’s rushing defense was better than its statistics made it appear, and that Army would have a tough time running inside. That was true, but the Mids’ defense played even better than we expected, holding Army to just 222 yards on 50 carries (4.4 yards/carry). That’s about 75 yards less than I thought we’d see from the Black Knights. Really, the Mids’ defense played even better than the stats suggest. The Black Knights usually get their 4.4 yards/carry reliably, which is why and how they pile up time-of-possession. In this game, though, it was more boom-or-bust. Hopkins had a long run of 17 yards, Walker had one of 51, FB Darnell Woolfolk had one of 18, FB Andy Davidson had one of 22, and SB Malik Hancock had one of 8. Just those runs together went for 116 yards or 52% of Army’s total 222 yards rushing. Besides that, Army went just 5/14 on 3rd down and 1/3 on 4th down. The Mids did a nice job bottling up the Fullback Dive and stringing out pitch plays towards the perimeter. That left Hopkins to get most of the tough yards off-tackle. It is therefore not surprising that he led the team with 18 carries for 64 yards and both Army touchdowns. He had a couple of absolutely clutch carries, including his first touchdown and a Quarterback Counter late in the game to set up the second touchdown. 6. We said that this would be a hard-fought game with the upside firmly on Army. The game was even in many ways, but Army created turnovers. That’s why they won even though they failed to capitalize on some opportunities that might have led to some separation. I mentioned the drops, but K John Abercrombie also missed his first field goal of the season, and Army let Navy off the hook once by running into Navy’s punter. Both teams punted four times. It’s worth mentioning, too, that the Black Knights got robbed of a 4th down conversion on a Quarterback Keeper. I mean, I get that it was close, but it was called a 1st down on the field, and there was clearly not enough evidence to overturn that call. How do you re-spot and then measure? That was terrible, especially after they spent more than six minutes reviewing it. Just admit that there’s not enough evidence and move on. That’s the rule. 7. 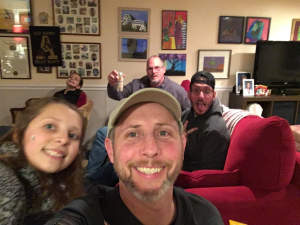 I didn’t get down to the game, but I had some guys over, and we had a good time. We even had curried goat courtesy of the local Jamaican place in town. It was delicious. Next up: Houston in the Armed Forces Bowl. 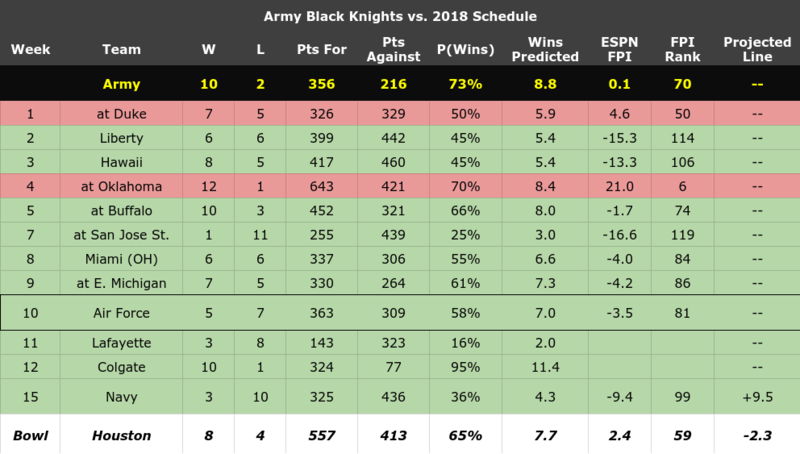 We’ll have more on this later, obviously, but my first impression is that Army has a great chance to win their third straight bowl game and finish with their first even 11-win season. That would be awesome. That’s all I’ve got, except to note that the official CBS Sports highlights are terrific. They’re also 15+ minutes, so settle in before you watch. Will you include on your Bowl show some prognostication on the future of the defense and possible candidates for D-Coordinator now that Bateman is a Tarheel? We’re definitely gonna talk about it. I’m not sure when. My sense is that the Bowl Preview shows are already pretty full, so it might be in the offseason. Really, Rob produces the show, so it’s up to him.